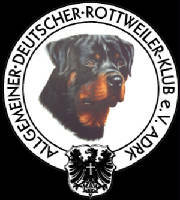 Our Rottweiler female Roxy, is an ADRK, pink papered German import who is from the World famous "von der Blockhütte" Rottweiler kennel in Sonneberg, Germany. Roxy is a super friendly, small to medium (56cm) tall female rottweiler with a very compact body (63cm) long, very wide chest with strong bones and very clearly defined rich mahogany markings. She has dark eyes (2a), dark mouth pigment, nice typey head with a very good stop. Roxy is not just beautiful to look at, she has the drive and temperament to do the work on the Schutzhund field. Roxy was trained and titled in Germany earning a BH and VPG/IPO I. She was handled, trained by Mathilde Agne and Klaus Jostock at his super training klub, BG-Speicher/Eifel ev. Roxy is line bred on the World famous "O" litter vom Hause Neubrand. Her sire is none other than Valentino vom Hause Neubrand, son of Oxana vom Hause Neubrand. Her dam is the very beautiful Ixa von der Blockhütte, daughter of world famous Rottweiler male Orlando vom Hause Neubrand. I feel very fortunate to own Roxy. She is such a wonderful all around female rottweiler. I think Roxy will have a very bright show career here in the USA at vom Schönen Dorf rottweiler kennel. On a more personal note, I would just like to say, "Thank You" Jacqueline and Guido for trusting me with this very special girl!!!! Small to medium, matching bone, short attentive, alert, friendly, nice typey head, medium ears, high set, very good stop, pigmentation mostly dark, vey good chest porportion, upper arm short, very good neckline, strong wide back, short, good anggulation, in rear, correcton coat and markings, in movement croup a little high, other wise free and fluid.